Does your son or daughter ever complain of feeling “out of breath” or “needing more air?” Breathing difficulties are common problems that often go overlooked due to their ‘invisible’ nature. Understanding normal breathing and various breathing problems is an important way to protect your child from breathing difficulties. Aside from your child informing you of trouble breathing, there are several other signs to look for when assessing a breathing issue. If your child has severe coughing attacks, continuous coughing, or is making a wheezing sound when breathing out or in, they are probably suffering from troubled breathing. Consulting a doctor in this case may feel extreme, but this is the best way to prevent further complications. 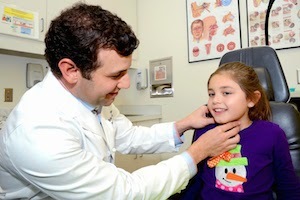 At Pediatric ENT Associates, doctors are on staff to provide greater understanding of your child’s breathing, along with an accurate medical diagnosis and effective treatment, to help you regain control. Difficulty breathing can be the result of a multitude of issues, some more serious then others. Let’s take a look at specific complications that can occur. Respiratory center in the brain isn’t working normally. Most people take breathing with ease for granted because their body’s autonomic nervous system automatically sends signals to the diaphragm and intercostal muscles to contract and relax at regular intervals. When the respiratory center in the brain is not working normally, these signals go awry and cause trouble breathing normally. If your child’s heart is having problems pumping blood to the lungs, there may be an issue with the pulmonic valve. This valve enters the lungs, allowing blood to travel to the pulmonary artery and into tiny capillary vessels in the lungs. From there oxygen passes into the lungs, while simultaneously ridding the body of carbon dioxide, a waste product of metabolism. Sometimes, a child’s lungs are just not functioning properly. Often, this is a case of Asthma, which includes coughing, wheezing, and chest tightness. Asthma attacks can be severe and are extremely uncomfortable. However, with proper care and maintenance most asthma sufferers enjoy healthy lifestyles with very few attacks. Issues with respiratory muscles can be the cause of muscle weakness, usually related to disease. Some of these diseases respond to specific therapies. However, regardless of the underlying disease, early identification of respiratory muscle weakness is essential because supportive care can provide symptomatic relief and improve the overall quality of a child’s life. Blockage of an airway occurs when the airway is obstructed, typically by something improperly chewed and swallowed while eating. Young children also run the risk of getting their hands on small toys or other objects not suitable for consumption. Airway blockage can be partial or can totally prevent air from getting into your lungs. Either way, a blocked airway is a serious concern and should be treated by a physician. If you have noticed that your son or daughter is experiencing difficulty breathing, whether large or small, make an appointment online from child ent specialist or call the physicians at Pediatric ENT Associates today at (205) 831-0101 to better aid you in identifying and treating this uncomfortable issue!